Arthur Hacker was the son of the engraver Edward Hacker. He studied at the schools of the Royal Academy (1867-1880) and in Paris under Leon Bonnet (1880-1881). His style sas influenced by the preraphaelites and the symbolists. Hacker travelled to Spain, Algiers (together with Solomon Solomon) and North Africa. In 1894 Edward Onslow Ford made a bust of him. In 1910 he became a full member of the Royal Academy. His wife Lilian Hacker was also a painter and she exhibited from 1909 to 1924 at the Royal Academy. He died in 1919 and was buried at Brookwood Cemetery near Woking. A quote from Shelley's "Adonais" was inscribed on his tombstone. Work: "Syrinx" (1892, Manchester City Art Gallery). 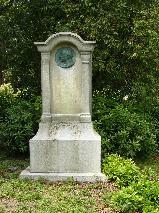 The grave of Arthur Hacker at Brookwood Cemetery, Woking.